If I’m remembering my childhood correctly, there was a time when I didn’t like winter squash. Hard to believe, because I can’t get enough of it now: roasted or steamed; stand-alone, stuffed, or in risotto or pasta; with sweet spices or savory herbs. On top of all that, I have discovered it makes a pretty darn good brioche. 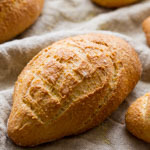 This bread is only lightly spiced so the squash flavor really shines through. Feel free to increase or tweak the spices to your taste. Also, it has less butter and sugar than a typical brioche; if you leave the pecans off the top, it could pass for dinner rolls, but the nuts push it over into pastry territory in my book. Either way, I think it’s a delicious and festive addition to a holiday table. 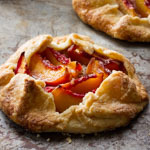 Place flour, eggs and egg yolks, milk, squash puree, spices, yeast, and salt in the bowl of a stand mixer fitted with a dough hook. Mix at low speed for about 4 minutes. It is normal for the dough to be quite stiff at this point, but if the dough is too dry to come together, add just enough water to allow it to do so. Turn the mixer back to low speed and add the butter all at once. Mix for a minute in low speed, then turn the mixer to medium speed and mix until the butter is completely incorporated. 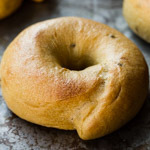 You should have a dough that is very soft and satiny, quite extensible (stretchy) but also strong and elastic (springs back after being stretched). 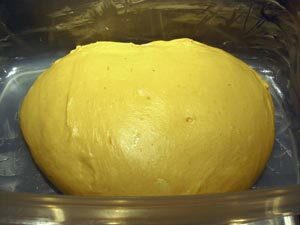 Transfer the dough to a buttered, covered container. Ferment at warm room temperature (about 76F) for one hour, then refrigerate overnight (8 – 12 hours). 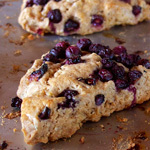 Divide the dough into 36 pieces of approximately 50 grams each. Degas each piece. Form each into a tight ball by placing it on the counter with your cupped hand loosely around it, and moving your hand in a tight circle several times. For large round loaves, lightly oil two 8- or 9-inch cake pans and line their bottoms with parchment paper. 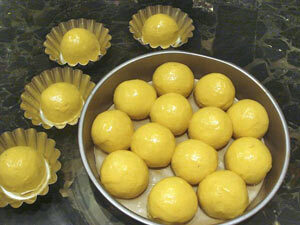 Place 12 or 13 dough balls into each 8-inch pan, or 17 or 18 in each 9-inch pan. 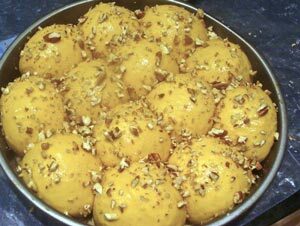 Any leftover balls can be baked as individual rolls, either on a parchment-lined baking sheet or in small, oiled brioche or tart tins. Brush the dough lightly with egg wash made from one beaten egg. Cover and proof for about an hour and 45 minutes at warm room temperature. 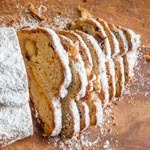 Before baking, brush the dough again, lightly but thoroughly, with egg wash. Sprinkle with chopped pecans if you like. Bake at 380F until the brioche has reached an internal temperature (use an instant-read thermometer) of at least 190F. This will take about 15 – 20 minutes for individual rolls and 30 – 40 minutes for the multi-roll loaves. The tops are meant to become a deep, dark chestnut brown, but if they become too dark you can lay a piece of parchment paper loosely over the top of the loaf after 25 minutes or so. Your brioche looks so wonderful, love the golden color… it really is the color of autumn. This is beautiful, love the color.. and love squash in breads too. I didn’t like squash/pumpkin as a kid too, now I love it! Looks delicious. I tried your brioche recipe and it turned out great. I’m sure this would taste great too! Just perfect. What a wonderful color! beautiful rolls! I love baking with different types of squash. What a beautiful bread! I’ve been learning how to bake more bread and I’ve done a brioche in the bread machine (shameful I know) and I liked the taste of it. I’m bookmarking this and maybe I’ll bake it to take to Thanksgiving dinner at my in-laws. This is gorgeous, Susan! And I’m sure it takes fabulous. Thank you for the warning not to adjust the monitor. 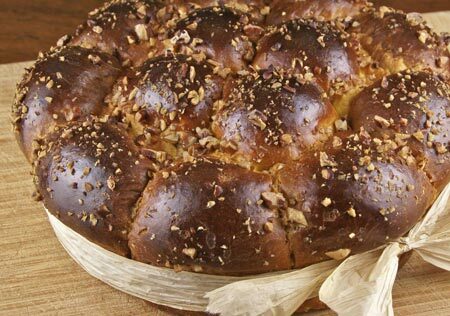 😉 Wonderful brioche! These brioche certainly look very festive! Do you think I could make this by hand? I’d like to give it a try, but don’t have a stand mixer at home. Something tells me the mixing will give me quite the upper arm workout though. This is a great idea. Squash is one of those things everyone knows they should probably eat more of (betacarotene, etc.) but a lot of people really dislike the texture. This gets around that problem and probably smells great while baking too! The color is really appetizing. Ohhhhhhhh. Yum. What a beautiful loaf, Susan. I love squash. Brilliant. You know, Susan, I just baked with butternut squash for the first time recently, and I was pleasantly surprised. I made muffins, but I’d love to try this brioche. The raffia ribbon is so rustic and pretty for this time of year. That bread would make a great centerpiece for a table. 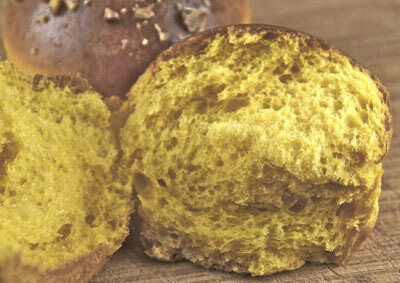 Butternut squash and brioche in the same place at the same time?? How delicious is that? I’m with Susan, this is a centerpiece! Gorgeous color and bread. I have to smile these days at all the squash I’m preparing and loving, as a child, well I’d have never requested any thing squash. Beautiful bread. This may be the only way I can get my daughter to eat squash I bet (it’s a texture thing). I wonder how this would be for Thanksgiving dinner? I love this! My whole life, my mom has made pumpkin bread on special occasions. It’s a loaf, not brioche like this, but it has a very brioche-like, rich dough. I love it, but I remember being very embarrassed when a kid in the cafeteria made fun of the “orange bread” in my lunchbox. Gorgeous! I have tons of butternut squash and have to try this! 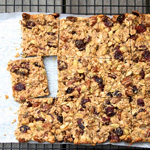 Just one question — when you use your mixer do you use the flat attachment or the dough hook? Jacqueline, mixing this by hand would be a challenge but certianly people made brioche before there were stand mixers so if you’re up for a workout, go for it! Love the colour of that brioche – am sure it would be wonderful with squash or pumpkin in it – I love it any sort of baking! 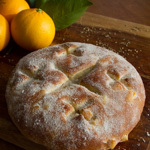 I just made a squash foccaccia recently; I adore baking with squash–and you know how I adore brioche. looks fantastic. Wow, that looks amazing. Who would have thought that you could use squash in a brioche? that looks amazing! i’ve been meaning to try a potato bread, but i bet butternut squash is even better. This bread was phenomenal!! Wow! I had a very wild yeast Thanksgiving – made the brioche, your english muffins and also the extra-sour sourdough (my new favorite bread). Is it possible to have the amounts of the ingredients converted from gram to cup for flour, and from gram to count for eggs? Ciao Susan ! I finally just made this wonderful brioche !!! It’s fabulous !! I’ll post about it soon and will leave you the link !! I found this recipe several months ago while looking for brioche recipes online and it sounded so wonderful that I knew I’d end up making it. And I did, today. Absolutely delicious and beautiful to boot. I bake once a week for a cancer support group, and as my friend who runs the group said, “Sometimes we have leftovers but not today. We ate the whole box!” (I use an old wooden soda box lined with tea towels and the two loaves fit perfectly, with just enough room around them for some of the individual rolls.) Thank you so much for your wonderful recipe. These look pretty darn amazing, I would like to make the rolls for a Monday morning pick me up. Do you think that the dough (shaped) can withstand another night in the fridge and be baked directly from the refrigerator in the morning? You are driving me nuts. I keep printing more recipes since I bought the book. Unfortunately the wild yeast has not yet arrived. These will be first on my list. I want to make them for a family get together at the holidays.